Never mind how many Moons the Earth has, how many planets does the sun have? Pluto got relegated a few years back. So eight. However, the hunt is on for so-called Planet 9, somewhere out in the Kuiper belt. But I have seen/heard rumblings that there be yet another, even further out. Chilly. So I will go for 10, but am willing to change my view in light of better evidence. Personally I'd go with a 'Nobody knows', because the current definition is possibly open to human interpretation and beyond Neptune there's all sorts of big rock. 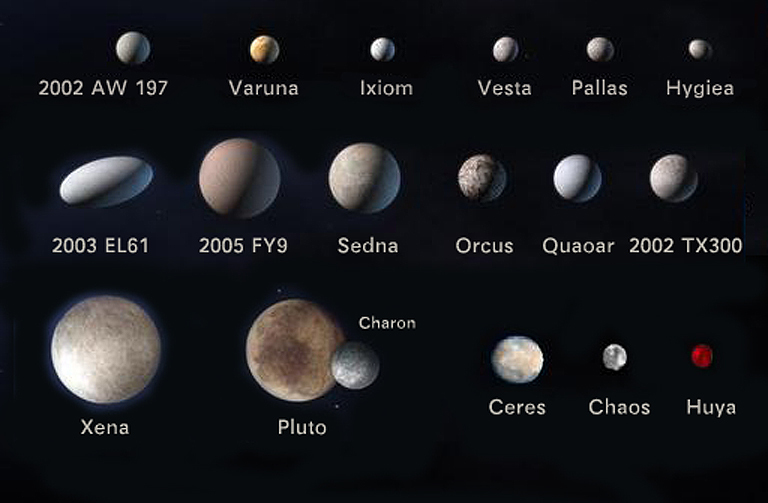 I thought they all count as planetesimals, or dwarves, as they have not cleared their orbits of other material, and that was one of the crucial factors in defining a proper, grown-up planet. Errrrr..... there's no "possibly" about it. It can only ever be human interpretation. Who else do you know about that has a say in it????? One thing that is a definite "nobody knows" is why Saturn's north pole has a cloud pattern in the shape of a perfect hexagon. During observation it also changed in colour from bright blue to gold, and again, nobody knows why. A great P-subject for discussion is of course Pluto, which has had so much discovered about it in the last two years that I almost want to make a separate thread for it. What on Earth is going on with 2003 EL61?! Is it made of liquid nitrogen and spinning at a very fast rate? None, because having planets implies possession, and property is theft. A bit tenuous, but I just found out that two books published by Tycho Brahe in the late 1500s are being digitized and are to be made available online. Plus they are planning a "what did Tycho Brahe observe on this date" where you can look up his actual observations. There's bound to be planets in it. To be launched in February 2018. I wonder if post 1271440 might provide some entertaining banter, especially if panellists included denizens of either Canada or God's own county. I can just imagine Sandi's face if she said, "Readers were asked what their ideal planet would be like. Now, "Like a Yorkshire [pud]", I could go with. Would that have an enormous crater filled with gravy? No, because then you probably wouldn't want to put jam on it. Jam on a Yorkshire pud? It is now known as Haumea, and it has a rotational period of slightly under 4 hours.